Woman has baby. Kid’s named George. No big deal, right? Mr. P.G., mascot of Prince George, B.C. Equally important, for Canadians at least, is the significance of the royal birth of Prince George to the struggling northern British Columbia city (pop. 75,000) of Prince George, B.C. The city’s tourist bureau spokesperson was positively burbling. “We just heard! That’s awesome. Woo-hoo! It’ll put us on the map,” she coochy-cooed. The mayor of P.G. said, “It’s a chance for us,” and promised to invite the royals, Duke-Duchess-and-eponymous-baby-makes-three, to the city’s 100th birthday in 2015. The only remaining mystery: for which British royal was P.G. named? The ever-reliable, about-to-be-dismantled Canadian Broadcasting Corp reminds us that the city was originally the fur-trading post of Fort George, established in 1807 by explorer-businessman Simon Fraser, who named it for King George III. A century later, in 1915, the Grand Trunk Pacific railway laid out a nearby townsite for its railway station, but it’s unclear which Prince George the new city was named after. One guess is that it was named for King George V, crowned in 1911 (only hitch: he wasn’t a prince then). ‘Nother guess: named for G the V’s youngest son, Prince G, not to be confused with older brother who became King G VI in 1937, but who was Prince Albert up to then. Oh, enough. No mystery about Mr. 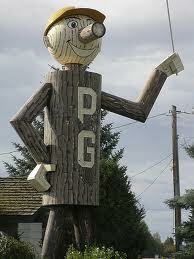 P.G., the town’s 8-metre mascot statue, erected as a symbol of the forest industry. When first unveiled in 1960 the statue could speak and bow. Like the forest industry, it now stands silently, welcoming visitors to the commercial hub of northern B.C. We admit that the prince definitely inherited Mr. P.G.’s looks. 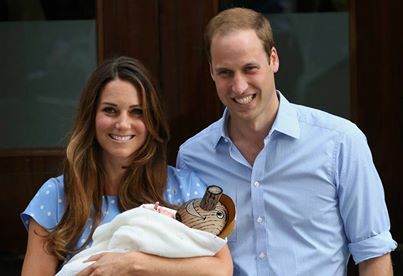 Kate, William, and prince P.G.